Journalism Next: A Practical Guide to Digital Reporting and Publishing, 2nd Edition 2 Edition Do you want to help build what's next for journalism? 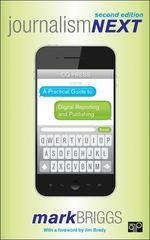 Then jump into Mark Briggs' proven guide for leveraging digital technology to do better journalism. The media landscape changes with such ferocious speed that as soon as new technologies gain a foothold, older ones become obsolete. To keep ahead and abreast of these ever-evolving tools and techniques, Briggs offers practical and timely guidance for both the seasoned professional looking to get up to speed and the digital native looking to root their tech know-how in real journalistic principles. Learn how to effectively blog, crowdsource, use mobile applications, mine databases, and expertly capture audio and video to report with immediacy, cultivate community, and tell compelling stories. Journalism Next will improve digital literacy, fast. Briggs begins with the basics and then explores specialized skills in multimedia so you can better manage online communities and build an online audience. Journalism Next is a quick read and roadmap you'll reference time and time again. Dive into any chapter and start mastering a new skill right away. And for today's journalist, who can afford to waste any time?